During the second half of the nineteenth century and first half of the twentieth century, over thirty million Indians traveled abroad as laborers, merchants, soldiers, policemen, students, performers, and pilgrims. This talk traces the history of these itinerant subjects by looking at the most intimate, but also often most public, moment of many migrants’ lives — their deaths. British officials developed an elaborate bureaucracy for documenting the deaths of migrant Indians and of remitting estates to their relatives back in India. In the process they created an “archive of diasporic death,” including wills, inheritance disputes, lists of effects, statements of next-of-kin, and coroner-court reports. These records provide a window into the everyday financial lives of migrants. Coroner-court records offer rare glimpses of “subaltern” credit-networks, noting, along with fatal wounds, stashes of IOU notes found on the dead bodies of Indian migrants. Wills and inheritance disputes reveal unwelcome deathbed revelations, such as a telegraph sent to a wife in India informing her that her deceased husband’s meager savings had been taken by his Chinese “housekeeper.” The presence of such private revelations in public archives also testifies to the deep entanglement of Indian migration with British bureaucracy. The talk asks how this history of “mobile” governance troubles assumptions about the modern, bureaucratic state that focus more narrowly on its territorial facets. 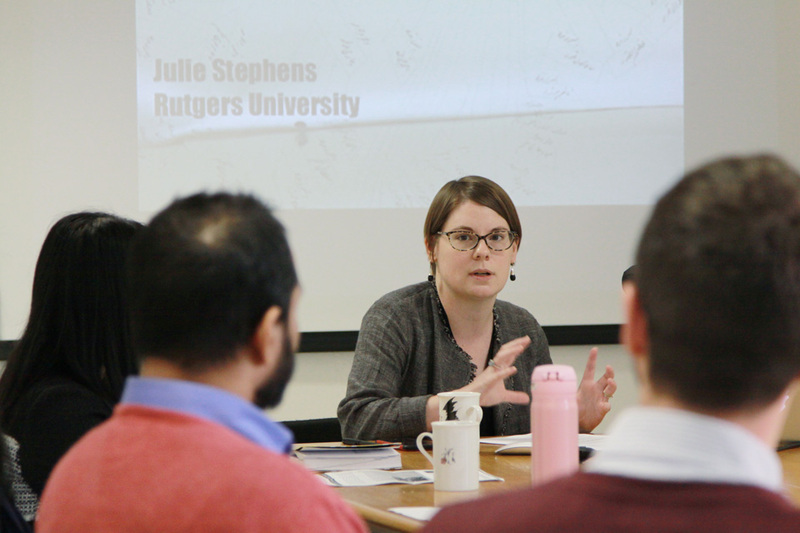 Julia Stephens is an Assistant Professor in the Department of History at Rutgers, The State University of New Jersey. 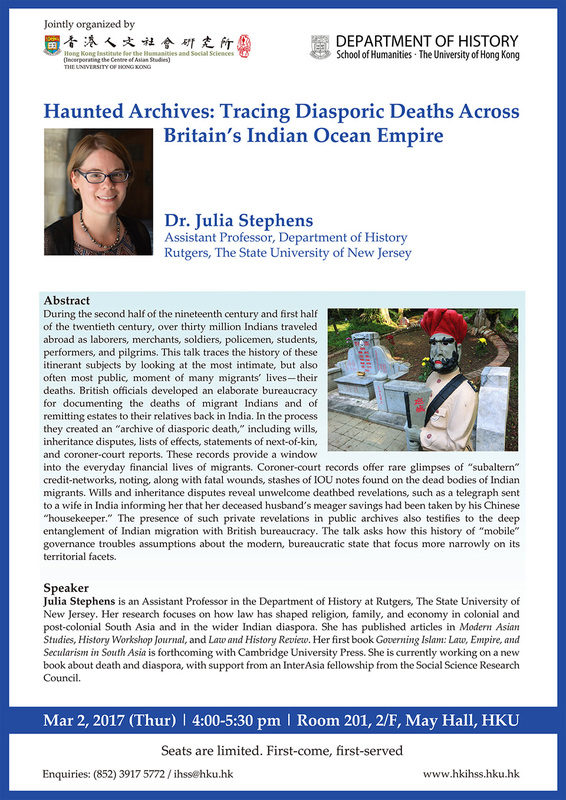 Her research focuses on how law has shaped religion, family, and economy in colonial and post-colonial South Asia and in the wider Indian diaspora. She has published articles in Modern Asian Studies, History Workshop Journal, and Law and History Review. Her first book Governing Islam: Law, Empire, and Secularism in South Asia is forthcoming with Cambridge University Press. 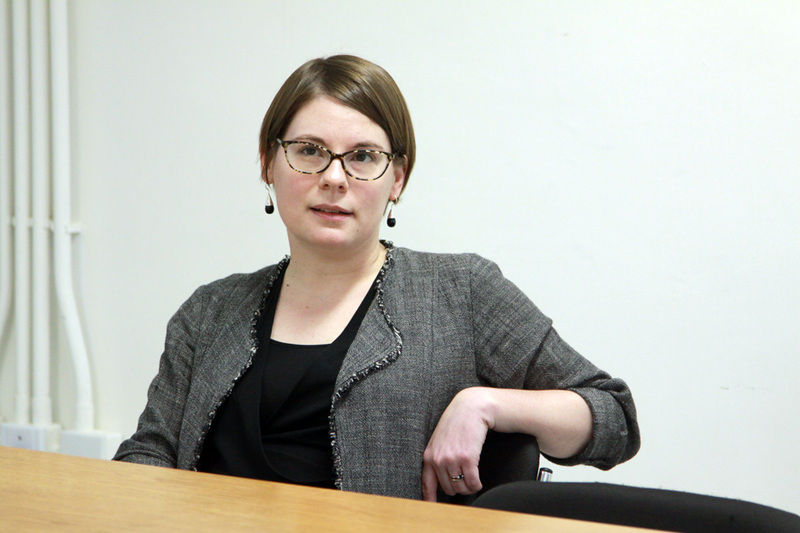 She is currently working on a new book about death and diaspora, with support from an InterAsia fellowship from the Social Science Research Council.